Jeremy Renner ousted from 'Avengers 2'? Jeremy Renner, who's now a fairly big name in showbiz, probably wasn't that huge when he signed on to play Hawkeye in Marvel's mammoth hit the Avengers. But by the time the film released and since, he's had several huge hits to his credit – namely Mission Impossible – Ghost Protocol, The Bourne Legacy and heck even Hansel and Gretel: WItch Hunters, which received a critical drubbing, managed to score at the box office. "At the end of the day, 90% of the movie, I’m not the character I signed on to play. I’m literally in there for two minutes, and then all of a sudden… All I could really work on was the physical part of it all, because that didn’t change. That was just the biggest challenge to overcome in playing the guy. Also, we’re pretty much introducing a new superhero character to everyone in a movie where there’s a thousand superheroes. So there’s not a lot of back story or understanding we can really tell about who Clint Barton is, or Hawkeye, and is he working for SHIELD or not. There’s a lot of unanswered questions, even for me. And I was OK with that. At least I was still in the movie. And I was glad for that." On the back of his comments, there's a rumour which claims that his Hawkeye could be recast in Avengers 2. There's no word of him doing cameos in any of the upcoming Marvel films, while other actors like Scarlett Johannson, Samuel L. Jackson et all are set to make an appearance in Captain America The Winter Soldier. It would be a shame if Renner was recast – it would ruin the continuity of the franchise, which Marvel have managed to thus far keep consistent, and to be fair, the actor was good in whatever little he did have to do in the film. Bear in mind, this is just a rumour doing the rounds, there's been no official comment from either Renner or Marvel. 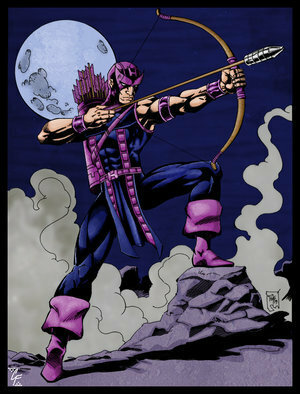 The next most obvious question would be, if Renner was in fact recast, who would you like to see as Clint Barton/Hawkeye? 'Baazigar' sequel in the pipeline?